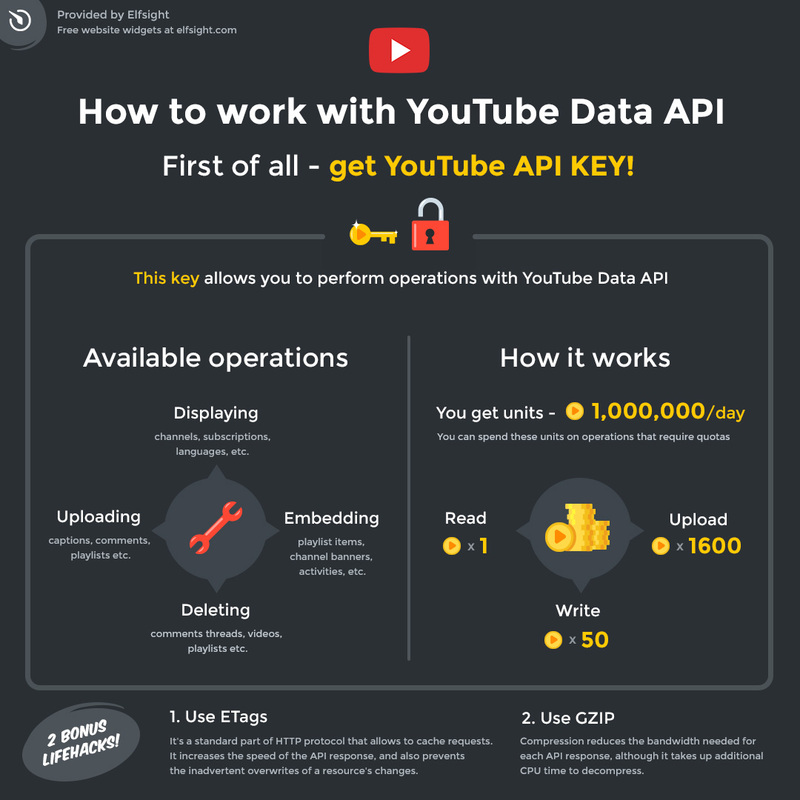 Read our detailed review to find out the best practices of working with YouTube API. Let’s analyze all the limits applicable to API requests, as well as the supported operations and request methods. Where is YouTube API applied? BONUS: create your personal YouTube Video Gallery in a minute! *The detailed article is under the infographic. In what fields is YouTube Data applied? First of all, we’re talking about the developers of website products and unique solutions. The other user groups are not so large: webmasters who use YouTube as the source of content for their sites, and researched who need to conduct a research with a large audience. Add API Key to ensure a YouTube plugin’s stable performance. Add the key to your product to get access to YouTube Data. 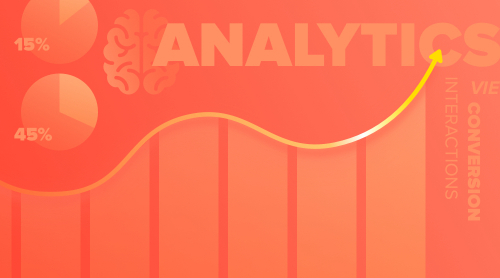 Use the key to parse YouTube data in a more efficient way. These limits are the restrictions to requests, sent out with a YouTube API. When the quota on your personal YouTube API Key is exceeded, your actions will be suspended until you get a new quota. You can find out the quota required for each action in the quota calculator. Daily quota: 1 000 000 units. Video upload – 1600 units. *Please, keep in mind that when you perform insert and update operations, they write data and so also return a resource. So the operation of inserting a playlist requires a quota of 50 units for the write operation, and the cost of the returned playlist resource. List (GET) – Returns a list of information’s that match the API request parameters. Insert (POST) – Uploads an element to YouTube and optionally sets the video’s metadata. Update (PUT) – Updates a video’s information. 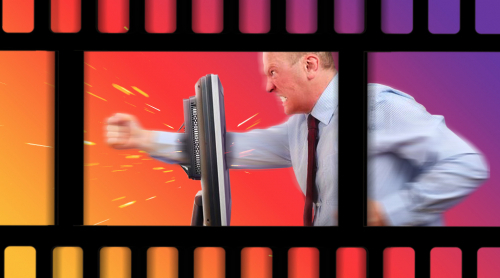 Delete (DELETE) – Deletes a YouTube element. Keep in mind that there are additional requirements for the videos uploaded via API. Read more: YouTube requirements to uploaded videos. Below are the resource types and the information you can get from these resources. activity Likes, marking videos as favorites, channel videos and other activities of a specific user. channelBanner Identifies the URL of a channel’s banner image. channelSection Channel’s latest uploads, most popular videos, playlists and other sets of videos from the channel. guideCategory Channel category, as defined by YouTube based on the content, popularity and other factos. i18nLanguage Identifies user interface language. i18nRegion Identifies the perferrable content geographical area. playlist Provides one playlist (set of videos). playlistItem Identifies a specific video from the playlist and the way it is used in the playlist. search result Video, playlist or channel that match the search criteria. thumbnail Identifies the resource’s thumbnail image. video Provides one specific video. watermark Video watermark during playback. Use ETags – a standard part of HTTP protocol that lets you cache the requests, thus making the API reply faster, and also prevents your apps from writing the changes from 3rd-party APIs. Use GZIP – compression that reduces the cost of each API response, but does spend additional CPU resources for decompressing. Create your personal YouTube Video Gallery in a minute!